A growing business needs to make the right choices with its available IT budget. Businesses want to contain costs and need to invest wisely in the IT purchases they make today that will power their business tomorrow. The new Lenovo System x M5 generation of servers delivers innovative technology assigned to improve security, efficiency and reliability for cloud, analytics and big data workloads. The new portfolio incorporates the latest Intel® Xeon® E5-2600 v3 processors, increased storage and memory capacity, along with dramatically increased performance for bigger data demands and faster insights. The new Lenovo® System x3500 M5 delivers big performance and storage flexibility in a small footprint. Choose from models with up to 32 2.5-inch or 12 3.5-inch drives. Leverage tiered storage with a combination of fast-access 2.5-inch and low-cost-per-terabyte 3.5-inch drives in the same server. Deploy up to two Intel® Xeon® processors E5-2600 v3 series for up to 36 cores per server. To further reduce energy costs, the x3500 M5 can run ample low-voltage TruDDR4™ Memory modules along with available high-efficiency 80 PLUS®Titanium power supplies that deliver up to 96 percent efficiency. 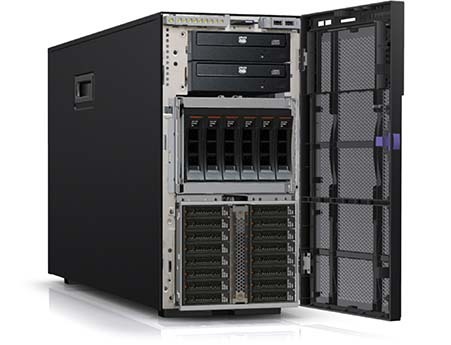 System x servers achieved the highest reliability of any x86 server. With the powerful, versatile new 2U two-socket System x3650 M5 rack server, you can run even more workloads, 24/7, and gain faster business insights. 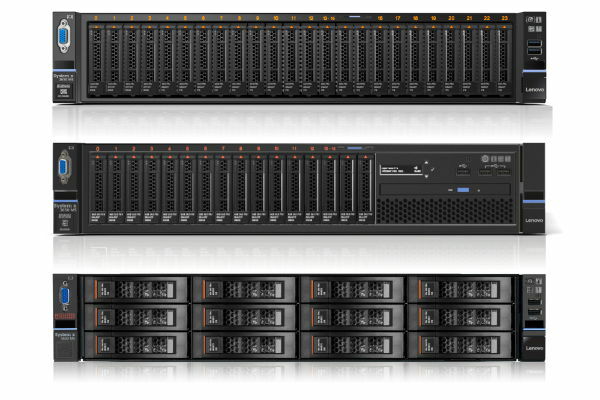 Integrated with up to two Intel E5-2600 v3 series CPUs and industry-leading, two-socket storage capacity, the x3650 M5 fast-forwards your business. You can select from an impressive array of storage configurations (up to 26 drive bays) that optimise diverse workloads from Cloud to Big Data. Up to two Intel Xeon E5-2600 v3 series processors with up to 18 cores each. Up to 45 MB per processor. Dual fan zones and extended operating temperature ranges maintain advanced cooling and efficiency. Up to 1.5 TB of memory with SK Hynix 64 GB (available at a later date) TruDDR4™ Memory LRDIMMs; System supports RDIMM/LRDIMM. In the era of cloud, big data, analytics, mobile and social computing, organisations need to meet ever-changing demands for storage while also improving data economics. IT must deliver more services faster and more efficiently, enable real-time insight and support more customer interaction. The right infrastructure allows clients to share information, secure transactions and drive real-time insights. The IBM Storwize family, including IBM Storwize V3700, helps organisations achieve better data economics by supporting these new workloads that are critical to their success. Storwize family systems can handle the massive volumes of data from mobile and social applications, enable rapid and flexible cloud services deployments, and deliver the performance and scalability needed to gain insights from the latest analytics technologies. 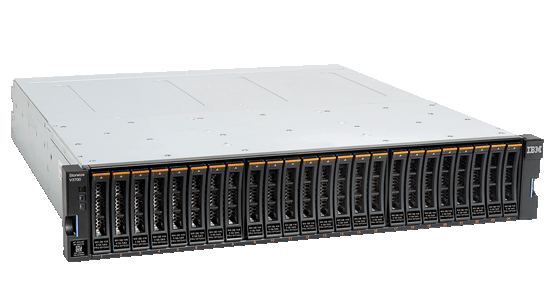 IBM Storwize V3700, the entry-level system in the IBM Storwize family, is an efficient, easy-to-use system designed to complement virtual server environments while delivering flexibility and innovative storage functions. Setting a new standard for power, Lenovo Workstations bring together the superior reliability you’ve come to expect and the innovative technologies your work requires. Designed for unmatched usability, Lenovo next-generation systems deliver ultimate speed and graphics for any profession — architects, designers, financial traders, medical and research professionals, and engineers. Mission-critical tasks require superior reliability and powerful performance. 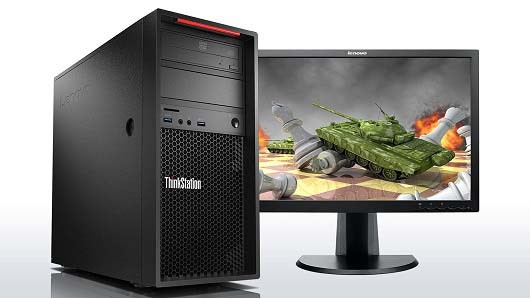 ThinkStation® P310 leads on both counts and does it with exceptional all-around value. Consider the latest high-performance Intel® Xeon® processors, NVIDIA® Quadro® professional graphics, cutting-edge storage technologies, including M.2, and innovative Flex module support for easy customisation, all surprisingly affordable. With an ultraslim 11 mm chassis, the ThinkCentre® X1 is born for the showroom. But don’t be fooled by its supermodel exterior. 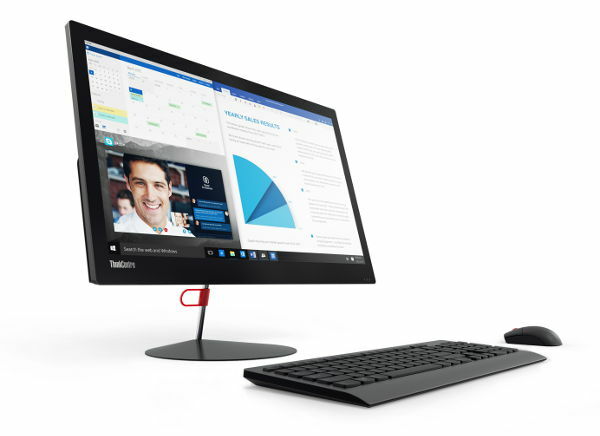 Delivering the performance of a desktop, with 6th Generation Intel® vPro™ processors, DDR4 technology and rock-solid data security features, the ThinkCentre® X1 is ready for work. What’s more, the solution, with its brilliant 23.8″ anti-glare display, has passed some of the most demanding US military specification tests. Delivering powerful productivity, the X1 is as tough as it is beautiful. Crafted from precision-milled aluminum to achieve the perfect combination of thinness, lightness, strength and thermal balance, while giving you a statement piece to make the perfect impression. With noise-cancelling technology, the dual array microphones reduce background noise and enhance speech. The X1 All-in-One is beautiful yet tough, having been tested to US MIL-SPEC. You’d never know it was tested under 2 kg of dust for 8 hours straight unless we told you. The world’s lightest 14″ business Ultrabook™ delivers supercharged productivity in a carefully crafted form factor optimized for the new nonstop life-work continuum. The Lenovo ThinkPad X1 Carbon is the no-compromise answer for users and IT who both want the same thing: technology made with the needs of a new class of business user in mind. Just 16.5 mm and starting at 1.21 kg – yet with the durability of the satellite-grade carbon fibre chassis. 11 hours of battery life ensures all-day performance. And the optional 4G LTE ensures you’re always connected. Powerful processors, a brilliant 14″ WQHD IPS or FHD IPS display and up to 16 GB memory. The optional 1TB PCIe NVMe SSD3 storage lets you open and save large files twice as fast than a regular SSD. Enjoy the freedom of working the way you want, wherever you are, with the amazingly light and versatile ThinkPad®X1 Yoga™. Use it as a Laptop or Tablet and in Tent or Stand mode for easy-viewing of the stunning display. The world’s first convertible with an OLED display, it delivers the most intense colour and stunning contrast. It’s fully connected with super-fast 4G LTE and totally versatile with a convenient retractable keyboard. With integrated Stylus Pen with Lenovo™ WRITEit software, you can enjoy the lightning-fast writing experience, just 15 seconds of charging gives up to 100 minutes of use. X1 Yoga™ is just 1.27kg light, thanks to advanced carbon fiber, housing a 14″ OLED display – intense colour and contrast. Powerful processors up to Intel® Core™ i7 vPro™, up to 1 TB PCIe NVMe storage, open and save large files 2x faster than standard SSD. Work in comfort anywhere with the versatility of four usage modes – Work, Present, Connect and Create. Next time you travel on business, there’s no need to take your Tablet and Laptop, let alone a projector for presentations. ThinkPad® X1 Tablet does it all! Customise it with optional modules like Presenter, 3D imaging or Productivity for additional ports, docking options, battery boost, and more. Amazingly light and thin, and with a convenient magnet-attach keyboard that looks and feels like a ThinkPad®, it takes mobile productivity to a new level. Amazingly portable, it’s only 1.1 kg with ThinkPad® X1 Tablet keyboard. Expansion modules like productivity, 3D imaging, and presenter (with an integrated pico projector) provide total versatility, up to 15 hours of battery life. The ThinkPad® X1 Tablet keyboard has a full-size ThinkPad® keyboard with TrackPoint, replicating the unique ThinkPad® keystroke response. Our thin and zero clients offer an array of high-performance features designed to be flexible, scalable and safe, all while integrating seamlessly with your work environment, whether you’re in the office or in the cloud. Only Dell offers comprehensive VDI protection with Dell Data Protection – Threat Defense, and Dell Data Protection – Endpoint Security Suite Enterprise. Featuring a unique Advanced Threat Prevention technology, data encryption, and hardened authentication from a single source. Dell Data Protection solutions protect end-user data, virtual and physical desktops (including thin clients), and make it easy to centrally manage endpoint security and compliance. Expect high performance with easy deployment. Handle demanding tasks like video editing with brilliant display resolution. Wyse thin and zero clients allow increased productivity with a broad range of highly secure endpoints designed for both stationary and highly mobile users, from task workers to the most demanding power users. 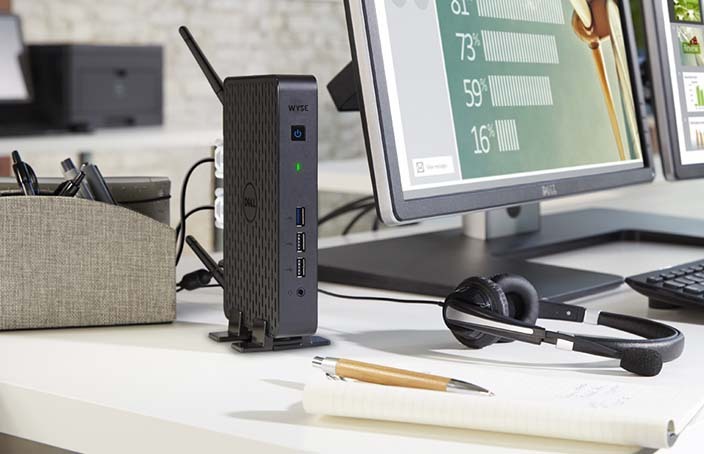 Wyse thin clients are compatible with numerous peripherals and connect via multiple protocols automatically upon deployment, offering versatile connectivity across a wide range of industries.